Because of the dependence of beam size on diffraction and aberrations as shown in Figure 2749, in order to achieve the optimum performance the diffraction and aberrations should be balanced as indicated by the optimum convergence semi-angles. 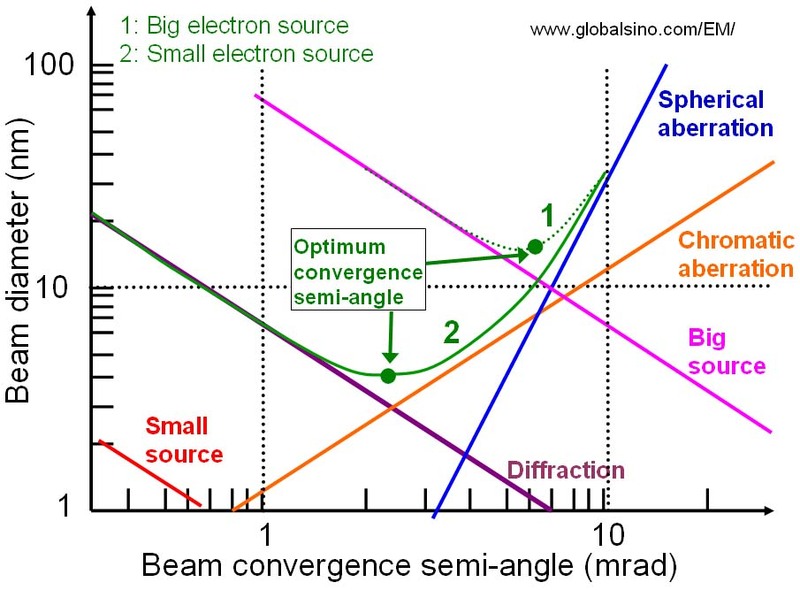 For big electron sources, at low convergence semi-angles (α), the diffraction mainly determines the beam size, while at high α the spherical aberration is the dominant factor. Figure 2749. Diameter of the electron-beam as a function of beam-convergence semi-angle. 1: big electron source. 2: small electron source. Note that the use of a large convergence angle, as occurs in the STEM mode with a focused probe minimizes the problems of channeling enhanced X-ray emission and electron channeling in EELS measurements. However, in practice, various convergence semi-angles are used by different labs based on the reality of their TEM/STEM systems and the users' preference as shown in page4941. The user can find the semi-convergence angle of the probe in the operation interface in some systems. The default semi-convergence of 10-15 mrad is optimum for most systems without Probe Cs-corrector. O. Scherzer, "The Theoretical Resolution Limit of the Electron Microscope". Journal Of Applied Physics. 20 20-29 (1949).